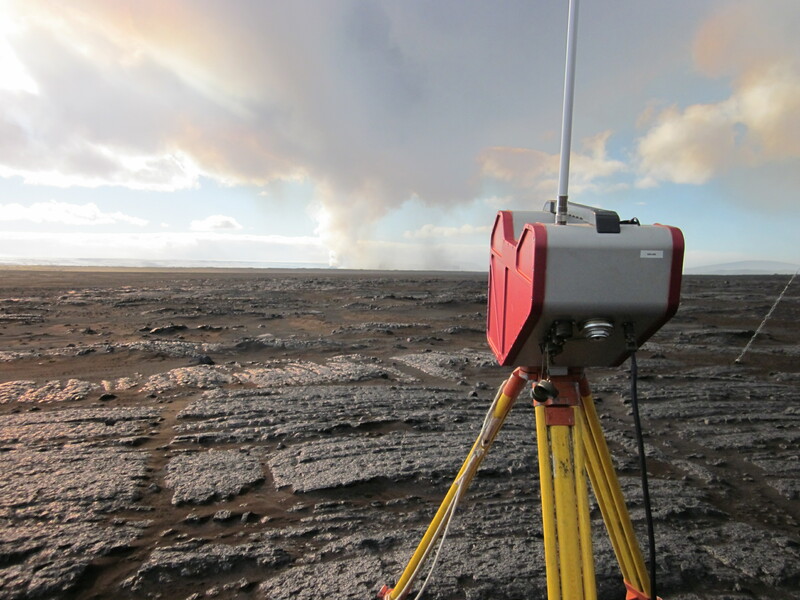 Last week, a team from Nicarnica Aviation alongside colleagues from the IMO and Nilu headed to the Holuhraun lava field in Northeastern Iceland to make measurements of the ongoing volcanic activity. 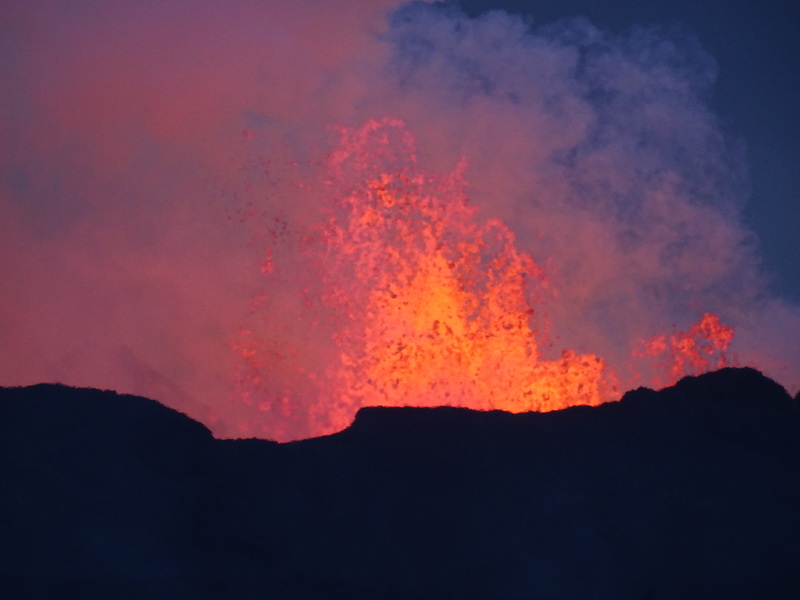 On 29 August 2014 a small fissure eruption began in the area which has been creating extensive lava flows and also releasing significant amounts of sulfur dioxide (SO2). Measurements of SO2 are important as SO2 aerosol can affect the radiation balance of the atmosphere and so can cause large scale climatic effects. In 1783 the eruption of another Icelandic volcano, Laki, released 120 Tg of SO2 into the atmosphere and resulted in below average temperatures across Europe for three years following the eruption. Knock on effects of such cooling events include reduced crop yields and subsequent food shortages. A more local, but equally frightening impact of SO2 is the effect on air quality around Iceland. The IMO have been issuing daily forecasts of the plume direction to allow residents around the island to prepare for the poor air quality that results from the volcanic gas. Finally, volcanologists are typically interested in SO2 emission rates as they can be indicative of the underlying type of volcanic activity and values are frequently compared between different eruptions. There are a number of different methods typically used to measure volcanic SO2 emissions from both space (satellites) and in the field. On the ground, spectrometer instruments such as DOAS and UV cameras are some of the most sensitive methods for determining SO2 emission rates, although these methods both rely on the absorption of ultraviolet light by SO2 in the plume. 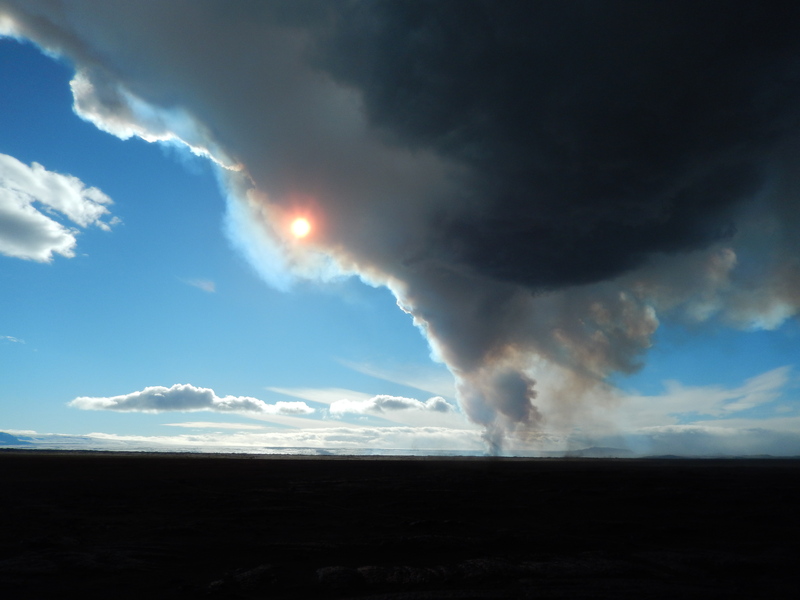 At Holuhraun, as winter approaches, these methods will be more limited due to the lack of daylight hours at such northern latitudes. 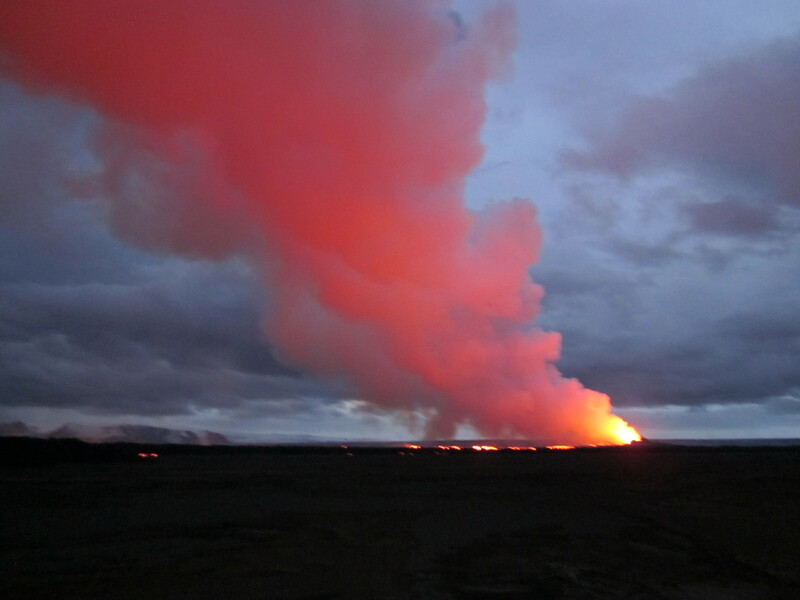 The NicAIR II instrument mitigates this issue by exploiting SO2 absorption features at infrared wavelengths and is able to measure volcanic emissions year round, 24/7 as it does not require sunlight to operate. The team took 3 NicAIR II instruments along with 2 UV cameras for comparison to the field last week. On the day, (25th September), we were incredibly lucky to have dry weather with scattered clouds. The conditions were almost perfect for gas measurements. 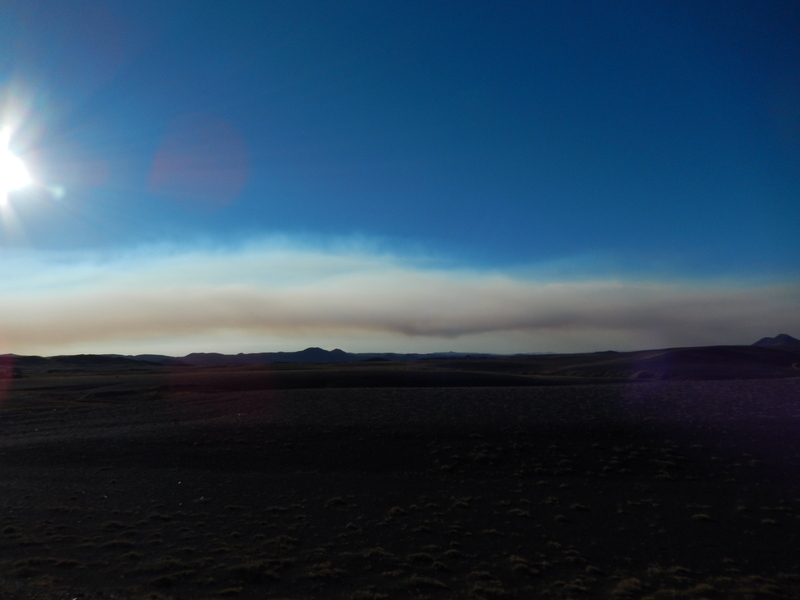 The plume was incredibly dense, with a distinct aerosol layer being visible from some distance away as we approached. After a four hour driver to the site, the view of plume was particularly impressive and we could really appreciate just how much gas was being released. This shot of the sun through the plume demonstrates just how effectively volcanic emissions are able to absorb the sun’s radiation. The three NicAIR II instruments and the two UV cameras were set up to image the plume gases. The combined use of multiple datasets will allow for a more robust estimate of emission rates. The image below shows one of the NicAIR II instruments at work. An estimate of SO2 emission from the satellite based sensor, OMI, on the same day, is a rather hefty 30,000 tonnes/day according to @simoncarn. Watch this space for an update when we have processed the data to see if our results yield similar values. . . . .
See more pictures from the trip in our gallery.